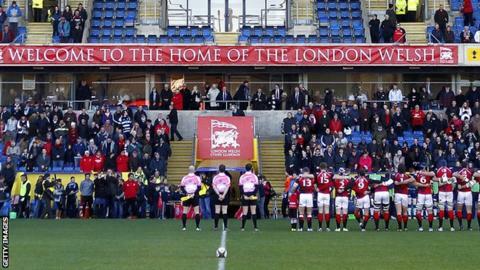 London Welsh have signed a new three-year agreement to continue playing at the Kassam Stadium in Oxford. The Championship club had been considering redeveloping Witney Town's old football ground after being granted planning permission. However, they have decided to re-commit to the Kassam, which they share with League Two Oxford United. "The Kassam Stadium is an excellent facility with a great pitch," said chairman Bleddyn Phillips. "We are delighted to be in a position to be able to confirm the club's commitment to Oxfordshire with the signing of this agreement." The club initially moved to the stadium in 2012 from Old Deer Park in Richmond after winning promotion to the Premiership. "The club is committed to establishing itself as a Premiership club and this is a very important step in that direction," added Phillips.